The debate rages on as to why real estate prices have grossly inflated and have completely diverged from basic economic fundamentals. Some blame foreign buyers and speculation while others dumb it down further to population growth and supply constraints. However, research from the brightest minds in finance and economics will tell you those are all symptoms of an underlying disease. The disease, is a prolonged credit cycle, combined with low interest rates, lax lending standards, and a hunger from banks to provide more and more leverage for homebuyers in need of a mortgage. As a result, household debt levels and real estate prices are at record highs. To explain further, I’ll pass this one off to the experts. Here’s what billionaire hedge fund manager Ray Dalio has to say. “There are two important cycles to pay attention to — the business cycle, or short-term debt cycle, and the debt supercycle, or long-term debt cycle. We are eight years into the expansion phase of the business/short-term debt cycle — which typically lasts about eight to 10 years — and near the end of the expansion phase of a long-term debt cycle, which typically lasts about 50 to 75 years. In simpler terms, During an expansion of credit, asset prices are bid up by those with access to leveraged capital. This asset price inflation can then cause an unsustainable speculative price “bubble” to develop. However, these prolonged credit cycles can only go on for so long. And as professor and respected economist Steve Keen says, countries such as Canada, Australia, Sweden, and the UK have them working in overdrive right now. 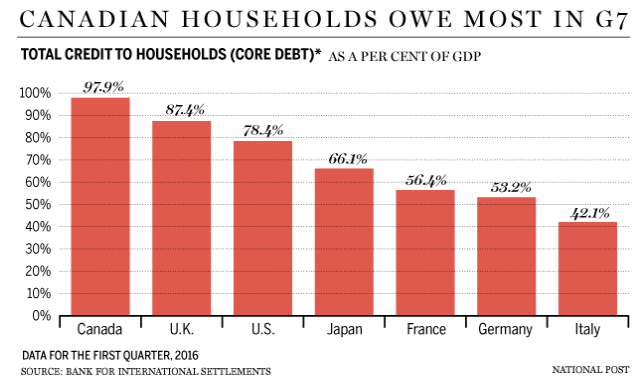 The more leverage, the more debt, the more house prices grow. “the level of leverage drives up house prices, drives up asset prices, works while the debt continues growing because that’s adding to demand, but then when the debt stops growing, demand disappears and the economy tanks.” says Keen. This is most evident in BC, which has experienced a phenomenal housing boom thanks in part to surging household debt from taking on larger and larger mortgages. 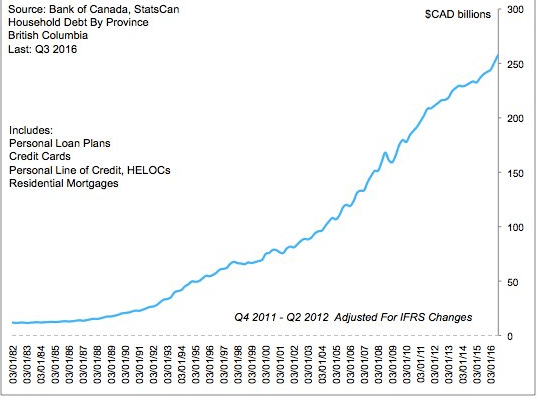 Year over year change in outstanding household debt in BC. And so as banks continue to lend and continue to provide more leverage, home prices will grow. But alas, eventually there is a debt ceiling.